Mimosa pudica is also known as the shy plant, bashful plant, humble plant, sensitive plant, or the touch-me-not. It is known for folding its leaves closed when something touches it. We first saw this at Trafalgar Falls in Dominica. To explain how this rapid movement happens, we need to look at the plant a cellular level. Plant cells are differentiated from other cells, such as animal ones, by two things: the presence of a cell wall and of a central vacuole. The central vacuole is an organelle in a plant cell; it's basically a big storage container. It stores food, waste, and water for the cell. When the central vacuole is full, it stiffens the cell. 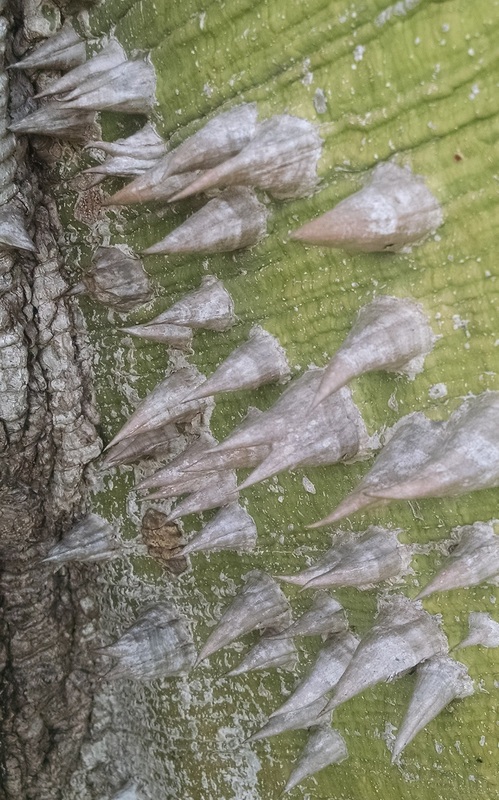 This is what makes plants stick up. This is also why when plants are dying or malnourished, the plant droops. There is not enough food or water to fill the central vacuole to support the plant cells. When the touch-me-not experiences stimuli, such as touching, blowing, etc., the plant stem releases chemicals such as potassium ions that force water out of the plant cells, causing the leaves to droop. 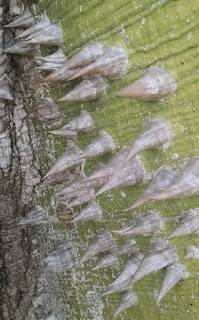 Hura crepitans is a type of evergreen tree also known as the sandbox tree, the monkey-no-climb, or the monkey pistol. 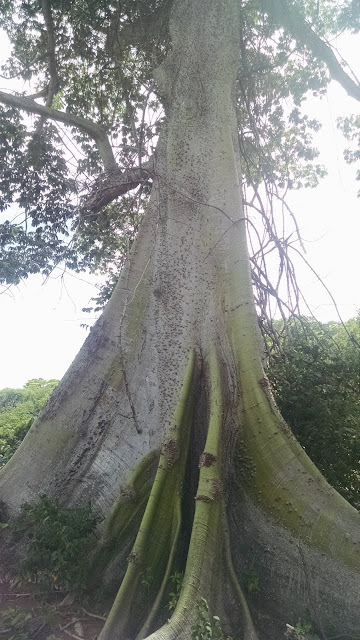 We have been seeing these trees since the U.S. Virgin Islands. 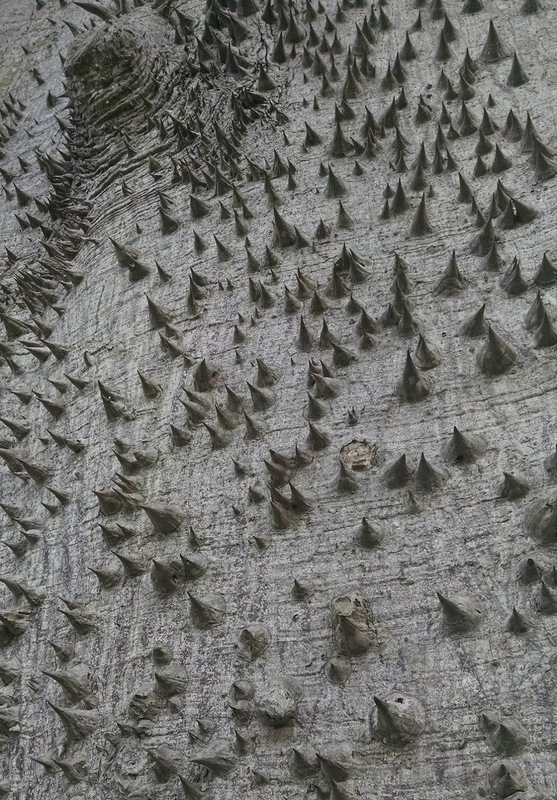 The main characteristic of this tree is the pointed spikes that dot the trunk, hence the name monkey-no-climb. And we know, from experience, that these trees are truly impossible to climb. Just look at those spikes! The name sandbox refers to the time before pens when the tree's seed pods were sawed in half and used as sand containers for ink blotters. 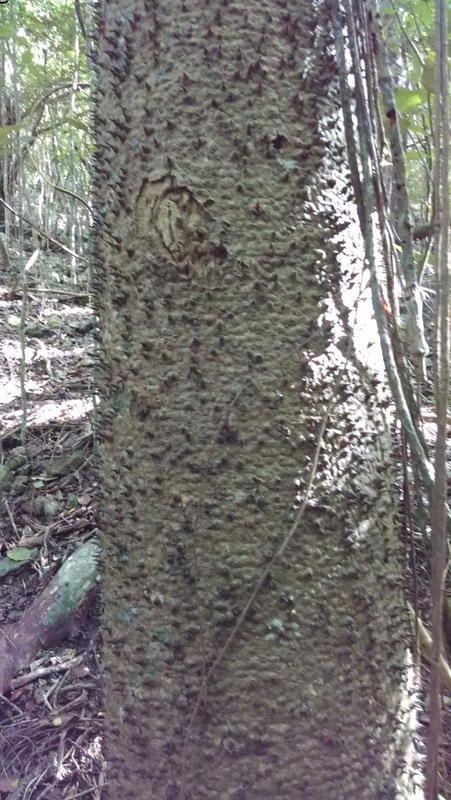 Its sap is poisonous, and has been used by fisherman to poison fish. The Caribs, the Native Americans that lived in the Caribbean, used the sap to make arrow poison. The name monkey pistol refers to the way the tree spreads its seeds. Ripe seed pods will explode, sending the seeds anywhere from 148 - 330 feet away. have seen are a bit smaller than this.